The following letter was written by me to Marnie Hay, author of the above book, on June 6th 2009. 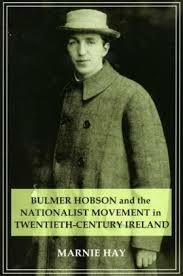 I have now finished your biography of Bulmer Hobson. I congratulate you on this excellent biography, obviously based on the most diligent and detailed research. You said at the launch that it took you ten years to finish the book. I am not at all surprised if I am to judge by the extent of the bibliography and the vast number of references. You have succeeded well in conveying the personality of your subject. He comes across as an energetic and quite an obsessional character with a compulsion to follow his political and social instincts and at times a reluctance to compromise. He also seemed to have the capacity to accept the frequent slings and arrows of outrageous fortune by retiring, if only temporarily, into the background. We had all heard of him preceding 1916 but in my case at least he had later disappeared from the pages of Irish history. An important aspect of your biography was the detailed information you provide about the many different forces and levels of nationalism which existed and evolved from the late 19th century up to 1916. I have to confess that up to now I had far too simplistic a view of these forces although I was aware of the conflict between some IRB members and Griffith, and the dominant role of the Irish Parliamentary Party. I do not think 1916 could have happened if there had been a greater coherence between pre-Rising nationalists and if the small minority of separatists had not been influenced by Clarke and McDermott, and eventually by Pearse and a few others. How many volunteers would have joined in the 1916 Rising if they had known that it was the action it proved to be and not simply manoeuvres? My father played a crucial part in the Ashbourne action and I doubt if the Fingal Brigade would have gone on the attack without his initiative and encouragement when, at the arrival of the heavily armed police force, Ashe thought of retiring. 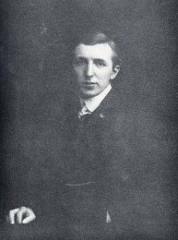 These facts are well documented and led either Diarmuid O’Hegarty or Denis McCullough to remark that ‘’Mulcahy was the only person who emerged from 1916 with a military reputation.’’ He was deeply religious and a man of peace. Would he have taken part in 1916 if he had known that he would be responsible for the deaths of nine innocent policemen? I often wonder why he refused to attend when the President, Seán T. O’Kelly, unveiled the monument celebrating the Ashbourne event in 1959. Was it the less acceptable aspects of 1916, as recorded by my father on tape during one of our conversations? It was hardly his poor opinion of O’Kelly and his concern of being patronised by him. By 1959 he had been fully reconciled to O’Kelly and, with my mother and family, he had often visited O’Kelly during the previous 14 years when the latter had been President of Ireland. If 1916 had not occurred, our conception of a nation separate from Britain would have been accentuated by the strong cultural movement which had much wider support than the forces of militancy which were unleashed by the Rising. The cultural revival which was gathering strength from the late 19th century to the Rising in 1916, added to the political consciousness following the 1798 centenary celebrations, had wide community support, from Protestant and Catholic as well as some of the land-owners and others who had no thought of separatism or even limited home rule. Yeats, George Russell, Standish O’Grady, Douglas Hyde, Edward Martyn, Synge, George Moore, Lady Gregory, Pádraig Colum, G.B. Shaw as well as Griffith and Rooney and the stirrings of Sinn Féin, represented a powerful force for national revival and national consciousness which would inevitably have led to a degree of self-government and separatism which would have satisfied our most ardent nationalists before 1916 and which would have avoided the disaster of our civil war and the long-standing and unnatural division of our country. I might have added the GAA, Conradh na Gaeilge and the National University among other progressive influences and the support of the British Irish Secretary, Birrell, for reasonable Irish aspirations. Hobson was certainly insightful in opposing 1916 and in his persistent faith in civil disobedience and guerrilla warfare, as was proved later during the War of independence. Without 1916 we would not have had the damaging rhetoric of the Republic. And his reputation was ill-served by accusations of cowardice. His correspondence during the early years of the Free State and up to his retirement was consistent with his restless concern about the wellbeing of Ireland. He must have had a measure of patience and forbearance to have encountered so much indifference and opposition to his ideas. Again, my congratulations on your seminal contribution to recent Irish history.